Unfortunately, most of us spend almost all our time indoors, either sitting or being still. In fact, many experts link the epidemics of diabetes, obesity, and other diseases in our country to the lack of physical activity in our daily lives. Thankfully, it doesn’t have to be like this! There are ways that you can get moving as a family; most of them don’t require lots of time or money. 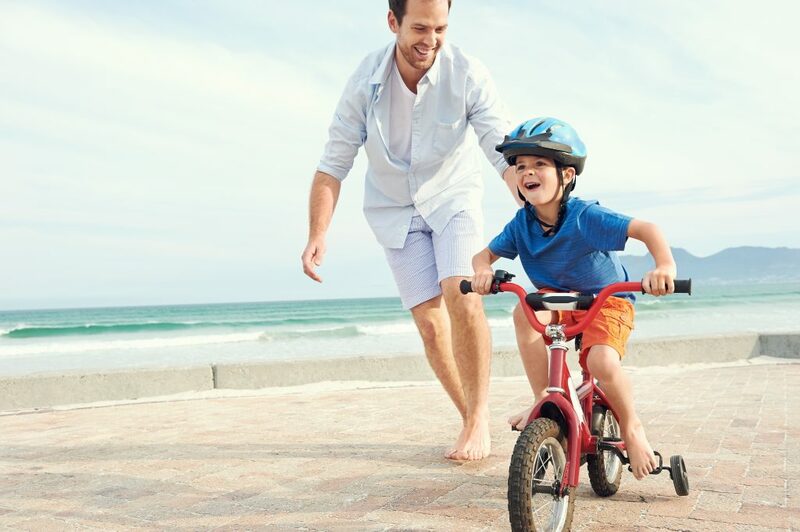 Here are five ways to focus on becoming a more active family. The word exercise carries with it the idea of a gym or intense environment, but it doesn’t have to be that way. There are many free workout ideas online, including really fun yoga and other videos available on YouTube. Your child will love doing the activities with you, and you will be getting fit together. Working out at home also allows you to customize your activity to your needs and time constraints completely. Only have 10 minutes: no problem! Find a video or circuit that fits your needs, and you’re in business. Most of these workouts don’t require any special equipment either. If you live in a walkable area, try walking for one errand or outing a week. It will take longer, but it will also get you some sunshine and exercise. Even better, it’s a simple way to get moving as a family and spend time together. It doesn’t need to be a big walk, just a few blocks to the post office is perfect. One lunch or dinner a week, pack up some simple food and head to a nearby park. Chapel Hill is full of beautiful outdoor settings. Even the UNC campus has several spaces that are perfect for picnics and family time. Be sure to take along your frisbees, playground balls, kites, or other outdoor toys. Then use your time after dinner to run around and have fun! Play tag, fly kites, and enjoy one another. Not only will your heart rate elevate for your cardiovascular health, but the laughter and fun will be good for your mental health too. Sometimes you need an unplanned, active, fun activity to get out some wiggles or worries. Those times call for a dance party! Choose some favorite tune and bust out your best moves, encouraging your child to join right in. You can have a dance off, play copycat, or wiggle until you drop. Regardless, this is a great opportunity to laugh and enjoy each other. Best of all, it is the perfect time to introduce your child to some of your favorite music from days-gone-by. Pull up those best kid-appropriate dance tunes from your younger days and let the giggles flow. It always seems easier to be outside when the weather cooperates. Unfortunately, if you wait for the perfect weather, you won’t get out much. Make a plan to get moving as a family regardless of what the weatherman says. Bundle up and build a snowman if we happen to have snow. Jump in rain puddles, play in a baby pool when the sun is at its hottest, and jump in leaf piles when the trees shed. If you prepare yourself in advance for any sort of weather, you’ll find it much easier to get out the door no matter what. When you take opportunities to get moving as a family, you’ll find that you feel more connected and in touch with one another. At the same time, you keep your body and mind healthy and strong. Start small and do what you can. At Legacy Academy, we value movement and activity for all of our students. As you look for childcare that will support your child’s development in every sense, consider Legacy Academy Chapel Hill, where kids learn through play every day.